The original idea of IS is to send two solid-gas streams to impinge against each other at high velocity, enhancing transfer between phases. IS is classified into two kinds: Gas-continuous impinging streams (GIS) and Liquid-continuous ones (LIS). 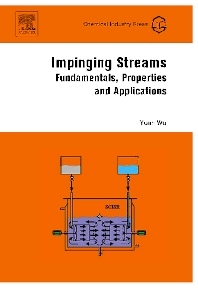 Impinging Streams describes fundamentals, major properties and application of IS, as a category of novel technologies in chemical engineering. Because of the universality of transfer phenomena, it is receiving widespread attention. This book represents the first book in this area for over 10 years and covers achievements and technologies. Chapter 13. Preparation of ultra fine powders by reaction-precipitation in IS: I "Ultra fine white carbon black"